Welcome Bride! Now that you've rounded up your best girls to support you on your big day, you want your bridesmaids to look their best, while staying in sync with your wedding's look and feel. How can you make sure you don't end up with a cookie-cutter bridesmaids? 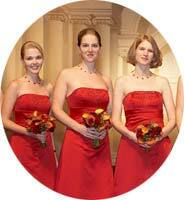 With customized bridal party accessories- beautiful handmade jewelry that is personalized to each girl. Jewelry customization allows each bridesmaid to wear the necklace and/or earrings that best flatter her coloring, face shape, and personality. What's more, you can rest easy with the knowledge that no matter which option she selects, it will perfectly complement your wedding. And what bride doesn't need one less thing to worry about? Custom, handcrafted jewelry is a bridesmaid gift that makes sense. A big trend with bridesmaid dresses is choosing the color and fabric of the dress, but letting each girl select the most figure-flattering style. Why not give her a similar choice with accessories? Most of our bracelets, earrings and necklaces can be customized by metal, gemstone and length. Filling a plunging neckline with a long pendant necklace or longer strands of pearls. Offsetting a sweetheart neckline with sparkling chandelier earrings. Pairing a shorter, collarbone-skimming layered necklace with a strapless gown. Add flair to a pastel dress with deep garnet or amethysts gemstones. Complement jewel tones like teal or emerald green with frosty shimmering chalcedony. Pick up the hues in the bridesmaids' bouquets with gemstones like rose quartz and yellow citrine. Put a contemporary spin on classic pearls by choosing exotics like keishi and coin pearls. Add contrast to a black dress with cascading keishi pearl earrings or a simple coin pearl necklace. Make a white bridesmaid dress dramatic with a bracelet of deep black onyx or luminous moonstones. Select a thematic gemstone and let each bridesmaid choose the necklace or earrings that best accentuates neckline of her dress. Go low-gowns with plunging necklines can handle longer earrings or necklaces. Example: Our 46-inch rock crystal and sterling necklace. Pair a freshwater pearl choker with a higher neckline for a lovely, demure look. Try offsetting a strapless gown or scooped neckline with bold, collarbone skimming chandelier earrings. Earrings can also be customized by metal and finding (posts). This makes it easy to accommodate bridesmaids that prefer lever backs to ear wires, or vice versa.